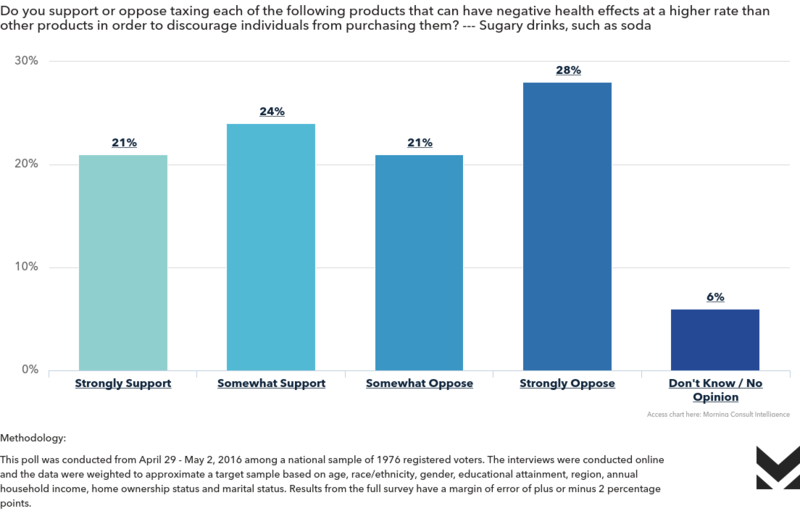 Americans are split almost evenly down the middle in their support of soda taxes, a new Morning Consult-Vox poll finds. That support extends roughly across several demographics: Democrats and Republicans, men and women, young and old voters. Berkeley, California is the only U.S. city that has passed a soda tax, although Philadelphia Mayor Jim Kenney is now pushing a similar plan. A poll of 1,976 voters asked whether they support taxing soda at a higher rate “in order to discourage individuals from purchasing” it found 45 percent of respondents supported or strongly supported the initiative, while 49 percent opposed or strongly opposed it. Among political parties, 44 percent of Republicans expressed some support for the tax, while 50 percent of Democrats did. That’s a much smaller different than many other policy issues.